"How far does a scream travel out here, Wyatt?" "Not too far…" IFC Midnight has debuted the trailer for the "pure-pulp thrill ride" Carnage Park, directed by Mickey Keating. The film premiered in the Midnight section at the Sundance Film Festival earlier this year, and is described as a "gritty, grisly homage to the glory days of grindhouse cinema." Carnage Park features Ashley Bell and Pat Healy as well as James Landry Hébert and Michael Villar. This trailer definitely has a grindhouse vibe with the saturated look, and seems like a great film to see at midnight in some old junky theater with a big bag of popcorn. Dive in. This pure-pulp thrill ride jumps between past and present as it pieces together the puzzle of a shocking crime. It's 1978 and a bank robbery gone wrong leaves Vivian (Ashley Bell) the hostage of two criminals on the run. But things go from bad to off-the-rails berserk when she and her captors wind up on the sun-baked desert outpost of a deranged ex-military sniper (Pat Healy), who ensnares them in his deadly game of cat and mouse. Carnage Park is written and directed by filmmaker Mickey Keating, of indie films like Ritual, Pod and Darling previously. The film first premiered at the Sundance Film Festival in the Midnight section. 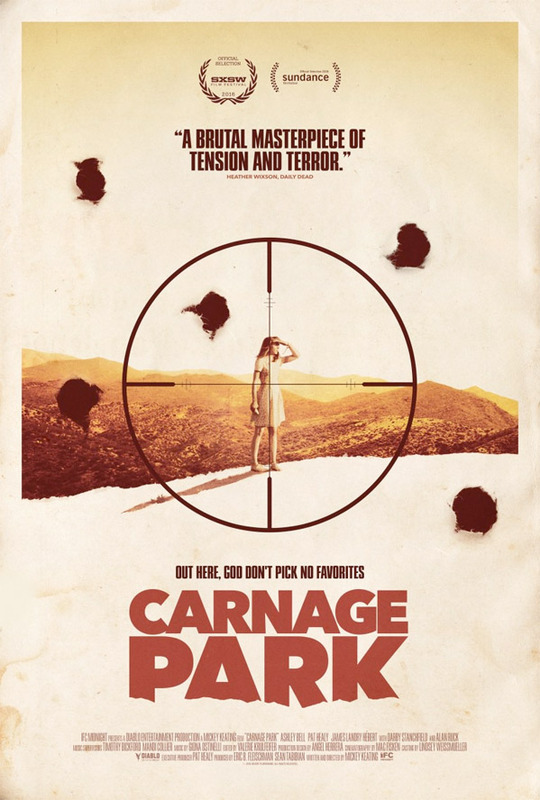 IFC Midnight will release Carnage Park in theaters + VOD starting July 1st this summer. Cool. I feel some Rob Zombie vibes.